We're settling in here in my mom's basement. We might be here a week. We might be here a year. At this point, it's anyone's guess. I decided this morning that Hubs and I would just have to move in to the apartment with the mean management. It won't be available until September 8 so we'll all have to make a few sacrifices. I called about noon. The lady said the apartment had gone this morning. Their next opening is in October. Because I am too tired mentally and physically to charm you with my usual wit and wisdom tonight I'm going to dump some August pictures instead. I don't have Instagram so these are all never before seen (And let's face it, the only reason I would get it would be to stalk Jef Holm) Hold on to your britches! 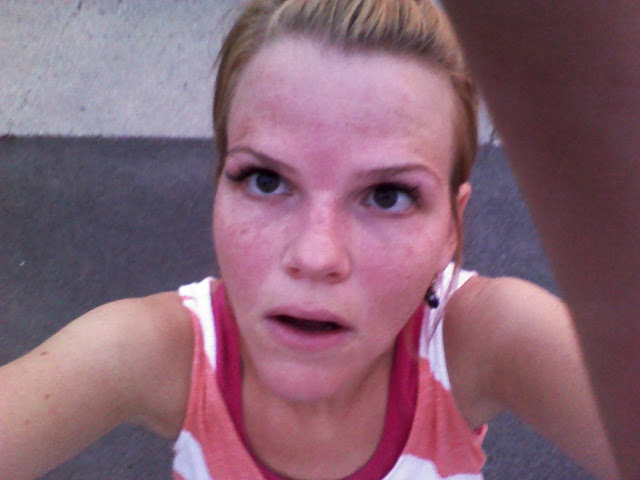 This is a picture of how hot I look after I work out. See the red splotches on my face? That's an aphrodisiac in some cultures, you know. Hubs had just finished obliterating me in tennis. He's a fierce competitor, that Hubs! One of my BFFs, Brooke, moved to Denver a year ago. She's on the right, smiling like an idiot. She came into town so naturally we hit up the water park. Brooke and Mandy are most likely going to be mad at me for posting this picture because, well, let's just say they're not exactly putting out the vibe like I am. 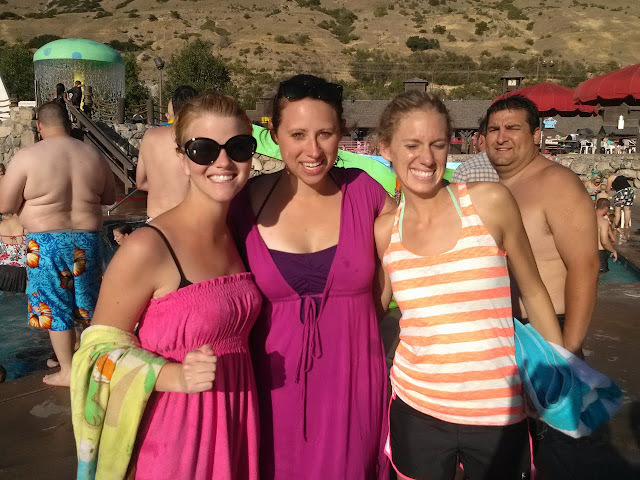 If I'm going to be honest with you folks I might as well tell you that I have another picture of the three of us in the exact same pose in which both Mandy and Brooke both look much better. But sometimes it just feels good to put ugly pictures of your friends on the Internet. As if every frustration that happened to me this week is worth it just knowing how powerless my friends are when it comes to my blogging choices. I commented on a blog. This picture of "me" came up. That is not me. That is not my child. If you know this woman, stop her now! She is POSING AS ME! Mandy's birthday party. 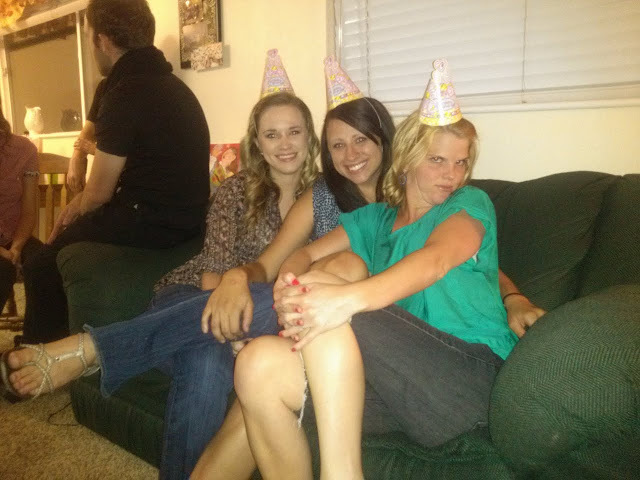 Mandy is single and she invited me over to her birthday shindig which involved a bunch of other single people. Hubs wasn't feeling up to partying with single people so I made a quick appearance by myself. Everyone looked at me like the true married freak that I am. They did not want to wear my princess party hats nor did they think my jokes were funny. Sheesh, it was a tough crowd! Being single is not as easy as it was in my day, I'll tell you. My best friend, Crazy A, had her baby! And named her Bonnie! Prepare to have your mind blown... in this picture you are seeing not one, but TWO Bonnies! Yes. It is possible. The baby is adorable and smells like a baby and cuddles right in to your arm and makes you wonder, "Golly, surely everything would be right in the world if I just had a baby like this to cuddle with?" My new lover. His name is Buddy. Property of my madre. He follows me around like the plague. Hubs is madly in love with the pup, but don't tell him I told you. Hubs tries to act tough, but I figured him out long ago. And that, lovelies, is a wrap. At the end of the day, God is good. Life is sweet. Home is about the people you're with. I'm feeling pretty dang blessed right now. Are you following me on twitter or facebook? Hi Bonnie! Thanks for stopping by my blog!! Glad to have found yours too! Hope you find a place to live soon!!! Although you could just downsize and live out of the trunk of your car for a while....I've done that! Two Bonnies! How can the world handle it? 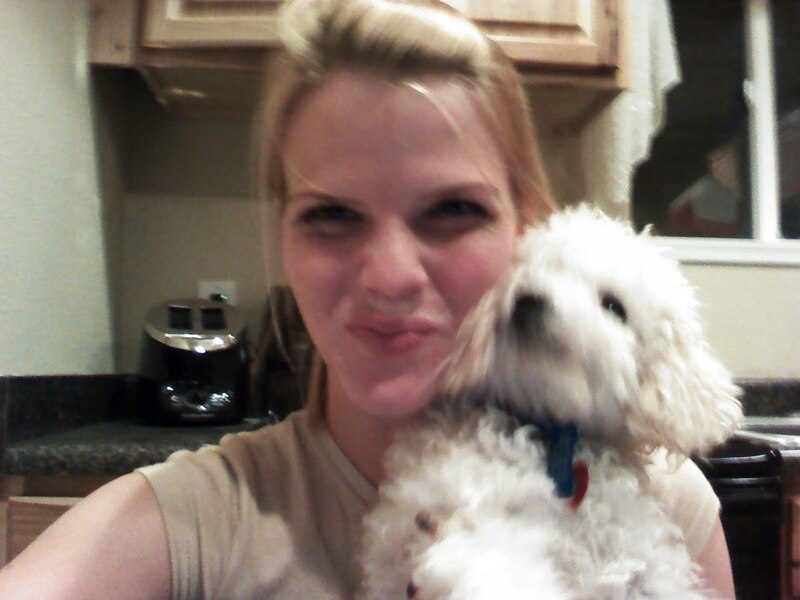 Cute photo :) and cute puppy too, I love him! Okay 1 if you ever figure out how they got their picture under your name tell me because I want to become Beyonce or Beyonce to become me you know what I mean. 2. Love the less than stellar friends pictures, I am going to have to steal the strategy to help me over bad days because it's your blog you might as well look how you want to look on it all other well they can start their own blog. 3. If you friends do start a blog of less than stellar pictures of you well at least you know your loved. I do hope you find a place soon! I feel your pain- my fourplex is being sold and turned into condos, so I may be a dweller of parental basements soon, myself. SOMETHING will come available, soon, for you. I just know it! In the meantime, keep posting adorable baby Bonnie pics, because that is totally dropping my blood pressure. i loved this, your posts are always so entertaining. 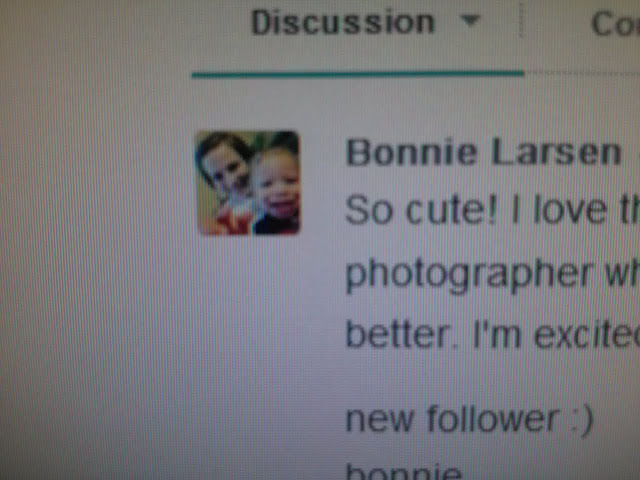 love the picture of you and the baby bonnie. so sweet!! and is someone seriously posing as you? what the heck? I LOVE the pic of you and baby Bonnie! Oh I want to meet her so bad! She is so adorable! I'm so sorry about your housing problems, who would have thought finding an apartment in Utah County would be so difficult? Your mom is so sweet, I'm glad you can stay there until you guys find a place. I didn't know that Brooke moved to Denver last year. I tried calling you just to chat, and I was going to leave you a voicemail but it was full. And then I remembered how much you hate voicemails and I figured you probably left it that way on purpose :) miss you! THANKS SO MUCH FOR THE BLOG LOVE! I appreciate the comment very much! Love your blog and by the way, you're gorgeous!!! Return follow =] and thanks for sharing all the pics! Makes me feel like I know you. Yay for your mom's place working out. That is the cutest dog!! Even if it's not your ideal living situation, it looks like friends are keeping you happy!! Have a great weekend! That dog = so. cute. I would've worn your party hats. Not only do you crack me up, but we have the SAME birthday!!!! :) Love your blog. Thanks for the follow, you are just adorable and I followed you back ;) Things happen for a reason, maybe you'll get something even better in October! What a cute doggie you have there! I admit that I did not even read your post. I just see your long eyelashes and I'm jealous. Thanks for stopping by my blog & leaving a comment. Those kirby vacuum salesmen are good as manipulating women & the older generation.. that's how they sell all those stupid vacuum's! I came over to your blog to leave a comment because I can't figure out how to reply on my blog, but I got sucked into your blog! I actually came over here a few days ago when I was camping & I haven't been able to stop reading all your posts! you are so sweet! love the pics! Have a great week ahead! Drop by nichollvincent.blogspot.com and say hello! sorry about living in the basement. We've all been there (3 weeks, in our case) but you do what you gotta do! That is a sweet little dog and it's only a matter of time before he totally runs the house! 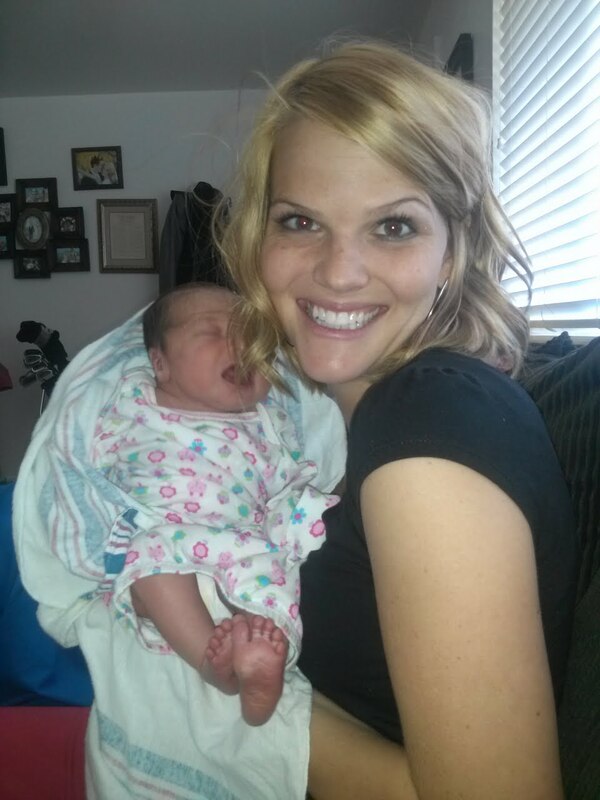 Congratulations to your friend and her precious new baby! She is so beautiful!